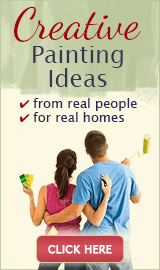 Decorative painting techniques are a great way to turn any interior home painting project into a masterpiece. So if you love decorating with paint but ran out of wall space, just look up - your ceiling is also a perfect canvas for many creative faux and decorative paint finishes! In painting and decorating, ceilings are usually not given much thought and often overlooked - they are painted the same standard, boring white color by default and look identical from room to room, from house to house. But did you know that in the most gorgeous and luxurious homes, professional interior designers devote as much attention to the ceilings as they do to the walls? The result of those efforts really pays off: the ceiling design then ties all the other elements of the decor together, and crowns the room for a very impressive and finished effect. 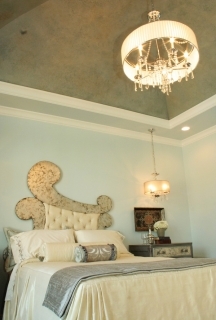 Dome and tray ceilings look especially fabulous when decorated with faux finishes - it's almost like they were meant to be adorned that way, and if you are leaving yours white, you are not doing justice to that beautiful architectural feature. Decorative and faux finishes are always a guaranteed way do add a WOW factor and some high-end drama to any decor, but they have an even more powerful effect when used on such unexpected surfaces as ceilings, so let's see which of the following ideas will be perfect for dressing up your own "5th wall". Clouds add a feeling of life and movement, and can look realistic or cartoonish, airy or heavy, peaceful or dramatic - it all depends on the color combination and the technique you use. Drag the clouds down the walls a little (in other words, continue below the ceiling line) - this will create an illusion of a deeper, more curved ceiling, and add another dimension to the clouds. Glazing is a very versatile, classic decorative painting technique that can look as subtle or as bold as you want it to. 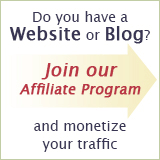 The number of colors you layer over one another, and the colors themselves will determine the effect that is created - for example, it can look like suede, velvet, leather or some other delicate or rich texture. Just like the clouds, this technique also needs a deep ceiling to look right, but you can use it on a flat ceiling if you drop the ceiling line at least 6 inches down the walls (to create a tray-like effect), and then continue the technique to the edge of the new ceiling line (to fill in the extra space on the walls). Venetian Plaster has a perfectly smooth, stone-like look and feel after the optional (but highly recommended) burnishing step. This polished finish reflects light and makes a room appear grander, so it's best to use it in the most important rooms in your house - the foyer, formal dining room or even master bedroom. 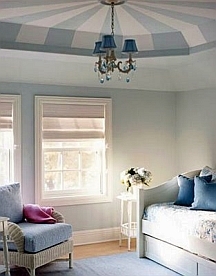 It looks great even on flat ceilings but needs a molding to trim the corner edges for a finished look. 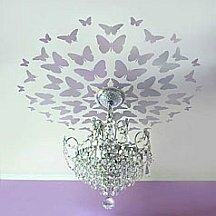 Stencils will adorn your ceiling with old-world, contemporary or even whimsical designs that can be as simple or elaborate as you prefer. 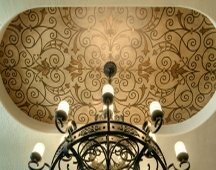 This decorative painting technique works on any type of ceiling, and it can be applied all over, only around the chandelier or along the perimeter of the ceiling, or just in the corners - for a subtle touch that will still add something special, and make it look as if you did take some time to consider your ceiling and make an effort to incorporate it into the room's design. 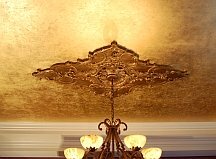 Gilded ceilings are absolutely breathtaking - whether used to highlight just the decorative crown molding in the corners, the medallion in the center, or on the entire ceiling, the golden leaf technique will evoke the feel of regality and splendid antiquity. This finish reflects light and is guaranteed to attract a lot of attention, so use it in the rooms that you want to really wow with (most likely, your foyer or dining room). 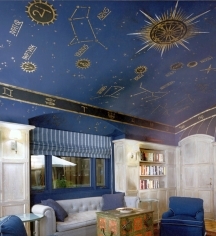 Murals and Trompe L'Oeil decorative painting techniques can range from very realistic (for example, a painted skylight imitation) to artistic (ex. Renaissance or angelic scenes) to cartoon-like (ex. a jungle canopy with monkeys hanging down) and everything in between. Murals need a high ceiling perspective to look impressive and to be really appreciated (otherwise they'll just "squash" the room vertically and create a suppressing effect). But in kids' rooms, they can work even on standard height ceilings because children are shorter than adults, and because oftentimes their murals are meant to be viewed or studied while lying in bed (for example, a world map). Stripes are a very striking ceiling painting technique because it is so unconventional - no one ever expects to see stripes when they look up! This pattern looks very effective on any ceiling type (including panel ceilings which are super easy to stripe), and can be tone-on-tone or very contrasting, wide or narrow, and go in any direction. And no matter your decorating style, if you like the look, you can usually find a way to use this idea in your home, because stripes on the ceiling can look appropriate in traditional as well as in contemporary decors - it's all in the color combination, size and placement. 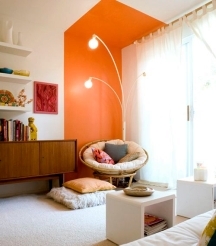 Color blocking is best done on flat ceilings and looks especially smart in boxy rooms that lack any interesting architectural detail. 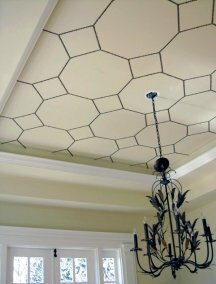 This decorative painting technique creates a focal point and an illusion of structure in the space, but unless your ceiling is high, you want to only partially accentuate it with a different color (to avoid bringing it down even more). 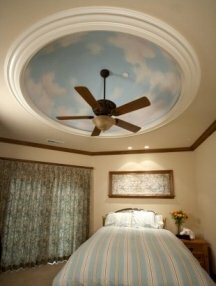 And while you may be able to find a way to make color blocking look elegant in traditional decors, contemporary homes and children's rooms are a much more natural place for this ceiling painting idea. An accent color on your ceiling is like a breath of fresh air because it's still so uncommon in mainstream painting and decorating, and rarely seen in real homes (unless your friends are all design nuts). This simple idea is a great way to pull your entire color scheme together, create a more intimate atmosphere in a large space by visually lowering the ceiling, and make the room look as if a professional decorator had a hand in its design. Any type of ceiling can be accentuated this way, but flat ceilings should have a crown molding to look finished (unless the room has a minimalistic decor). 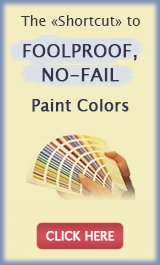 This list of decorative painting techniques is not complete, but it should give you enough creative inspiration and a starting point for designing your own ceiling. 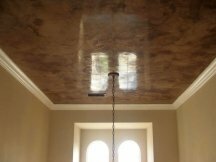 Besides, you can often layer the techniques to customize the end result even more - for example, use stencils over a venetian plaster finish, or apply some touches of gold leaf over glazing, and so on. Just remember that whatever painting idea you use, the color and style of the ceiling should relate to the rest of your decor to look relevant and connected. Here are some more creative painting and decorating ideas for you to explore - they've been submitted by our site visitors just like you, so take a look and don't forget to leave a comment! And if you have your own ceiling project to share, click here and see your name in lights.